The elf bard Edel returned to the Virren home that evening to meet Naladella's father, Laeroth. This elderly, silver-haired high elf commiserated with him over the loss of their homeland, Fendorlis. Laeroth had been a minor noble with contacts in the royal court, so while he was not present for the destruction of Amaranth Palace, he had heard fragmentary stories of what happened. He knew that the "Eight Swords of Amaranth," composed of King Mellaranthiel and the greatest heroes of the elven court, attempted to defend the palace from the Tarrasque, but half their number (including the king) were slain by the beast. When the kobolds of the Zolothi Compact conquered the kingdom a few years later, many high elves swore the Oath of the Bloody Tree, promising to avenge their dead and reclaim their homeland. Some of the Sworn lead the resistance against the Zolothi. Others led and defended the survivors who sought safe haven elsewhere. Laeroth claimed to know some of the Sworn, but communication with the rebels was, naturally, rather difficult. Fendorlis was made a Zolothi province, and is now ruled by Viceroy Thraximandrykar, a half-dragon kobold general. The kobolds have used their sorcerers and growing fleet of airships to pacify the region to an extent, but the resistance still fights on. Two major holdouts that Laeroth knew of were Changir, the orc-infested southern border, and the Dragon's Eye, a gnomish stronghold on the Dragon's Head peninsula. Laeroth eventually revealed that he was a dreamspeaker, a rare type of mystic with special powers over dreams and sleep. This gift allowed him to send messages to others via dreams. He used this power to keep in contact with other dreamspeakers scattered by the diaspora--but over the past few decades, age and war have thinned their ranks to a bare handful. Sadly, Laeroth did not know Edel's missing mentor, Ruvaen Luvaris, but was familiar with the city where the bard last saw him during the invasion. However, the older elf was able to give some information about the surviving Swords of Amaranth. These include: Corodel Zorliss, former captain of the royal guard, a famous swordswoman, and one of the first to swear the Oath of the Bloody Tree; Seledrine Delune, royal archivist, who led part of the diaspora to Radavalion (kingdom of the gray elves); Tornask Starbrow, a gnome holy man and explorer originally from the Eye; and Aiziria, a fey mistress of plant magics. Laeroth has had occasional contact with Aiziria since the conquest, and believed she could be found in the Eye. In return for Laeroth's information, Edel told him about his own recent adventures. The young bard believed that his new companions might, in time, become allies in the effort to retake Fendorlis. This news pleased the elder Virren--though he was surprised that a high elf would count half-orcs among such allies. He found Edel's story about the death cult quite disturbing, but admitted to not being well-versed in non-elven religions, so was unable to contribute anything on the subject that the bard did not already know. Laeroth advised caution, but observed that this seemed a good opportunity for Edel to test his mettle and start making a name for himself. During Fatou's training period, the rogue Jubair and cavalier ZhaZha spent some of their idle time scheming about ways to make more money. One of their plans involved writing up a deed to the world--the entire world--in the name of "Blackbeard the Undying" (which Jubair thought "sounded like a good death cult name"). They have yet to show off their handiwork to any fellow party members, or potential marks. Edel spent a good deal of time exchanging geography lessons with the half-elf monk Lucretia, comparing notes about their elven heritages. (She is a half elf, kin to the wood elves of Allasimar on the northern continent.) Edel shared most of Laeroth Virren's news about Fendorlis with her. Meanwhile, the half-orc inquistor Jumari was determined to track down more death cultists. During her last stay in Zahallan, before the caravan adventure, she had encountered a gang of graverobbers. One of them had borne a symbol of Asmolon's cult, and she suspected the existence of a black market for body parts. She decided to stake out a local cemetery as a way to find more of these criminals. 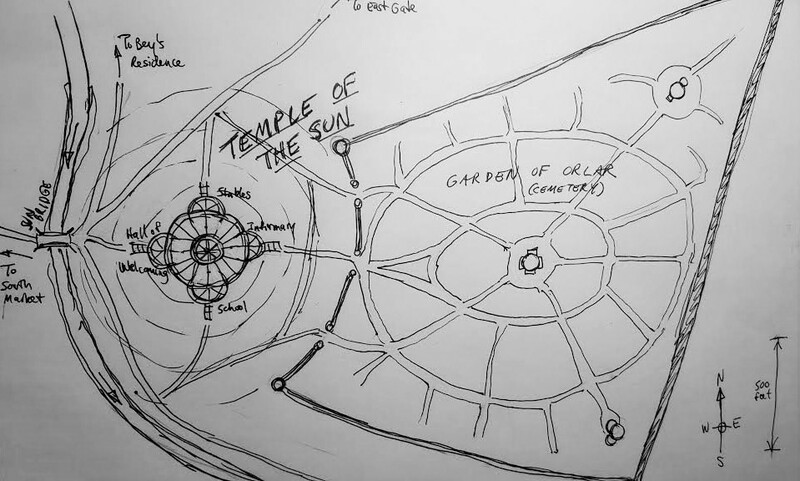 She chose the graveyard attached to the Temple of the Sun, formally known as the Garden of Orlar (after the halfling name for the Sun). Her first few attempts had to be cut short because the temple's patrols detected her presence; her darkvision helped her elude pursuit by the human guards. Then one night, she managed to evade the patrols long enough to see something of interest. Flickers of dim light drew her towards the northern side of the cemetery, where she saw a half-dozen figures gathered around a burial plot. Three men dug up the grave while a fourth held a heavily-shuttered lantern for them. Two others, a man and a woman, stood a short distance away, keeping watch. Jumari patiently remained hidden to watch them. After a while, the male lookout--a burly half-orc in light armor--relieved one of the human diggers, but the woman merely supervised, giving occasional hushed orders. Eventually, she spoke to a smaller figure that Jumari hadn't seen at first. This was a halfling, who started skulking in the inquisitor's direction. Jumari retreated; the halfling followed her, keeping behind the cover of stone monuments as much as possible. When the little sneak got close enough, he tried to hit Jumari with sling stones, but missed. He then hissed, "Get Spooky," and a black cat burst from cover and darted off towards the rest of the graverobbers. Jumari rushed the halfling and downed him with a bleeding touch attack. She lingered long enough to wipe his blood off her hand with a rag, which she pocketed. She then left quickly, before the cat, which she suspected was a familiar, could bring reinforcements. The next day, the party reunited to exchange news. The wizard Fatou announced her new status as a cleric of Yaziel, goddess of the moon and magic. Edel shared some of his news about his homeland, complaining that Fendorlis remained in the hands of despicable kobolds. Jumari reported on both of her encounters with graverobbers, which prompted a discussion of how to address the problem. Fatou suggested they write a letter to the temple to warn them of the issue, while Lucretia proposed posing as guards to catch the villains. ZhaZha was in favor of finding and beating up the cultists, leaving one left to question to squeeze for information about the operation. Jumari pointed out that telling the temple would result in more patrols, which would likely scare off the graverobbers they wanted to catch. Edel suggested they all visit the cemetery during daylight first, before making any further plans. and the others agreed. 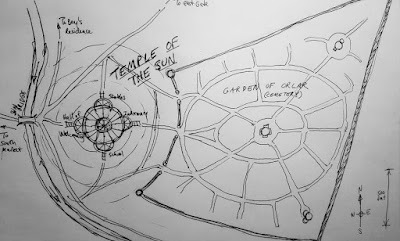 The Garden of Orlar was a large walled memorial garden in the southeast corner of Zahallan. It stretched nearly half a mile from the temple hill to the town wall. A number of temple servants and townsfolk could be seen around the grounds, which reassured the party that daytime visits were commonplace here. As Jumari led the group into the grounds, they passed a funeral service for one of the sun god Talitar's flock. Fatou paused to watch the proceedings from a respectful distance, curious about how similar such rites were to her experiences in the capital. The others split up to look for disturbed graves. Edel and Lucretia wandered through the southern side of the cemetery, but found no disturbed earth there. They paused at one of the larger mausoleums, but could not read the Halfling script carved over the door. Jumari led Jubair and ZhaZha towards the northern side of the grounds, where last night's crime had occurred. Two temple servants were refilling a grave there, overseen by a cleric chanting some prayers. Rather than disturb that work, the trio scouted around at a distance. Jumari found the marker beside which she had taken down the halfling, and found copious bloodstains on the ground. She doubted the loss was fatal, as she saw signs that someone had kneeled here, plus both human- and halfling-sized tracks leading away. The tracks led them to the north wall of the cemetery, where they found signs that the graverobbers had climbed a section with a rough patch in need of repair. They searched around to see if any tools had been concealed nearby for a later attempt, but found none. After the temple folk finished their work restoring the violated grave, Jumari took a closer look to see how recent the burial had been. Based on the dates on the stone, the deceased was interred a couple months before--too long ago to provide a fresh corpse to any robbers, but likely still more than just bones. Lucretia and Edel returned to the others. The monk asked Fatou if she wanted to go inside to talk to the priests, and the newly-minted cleric agreed. Inside the main entrance, they found a large open area where visitors, priests, and temple servants passed in and out on various errands, while a handful of armed warriors in temple livery stood guard, and a minor cleric greeted visitors. Fatou approached this priest in order to ask some questions. She started by inquiring why Zahallan had separate temples for Talitar and Yaziel, while back home to the south, she was accustomed to all the Javanian gods being worshiped in a single shared site. 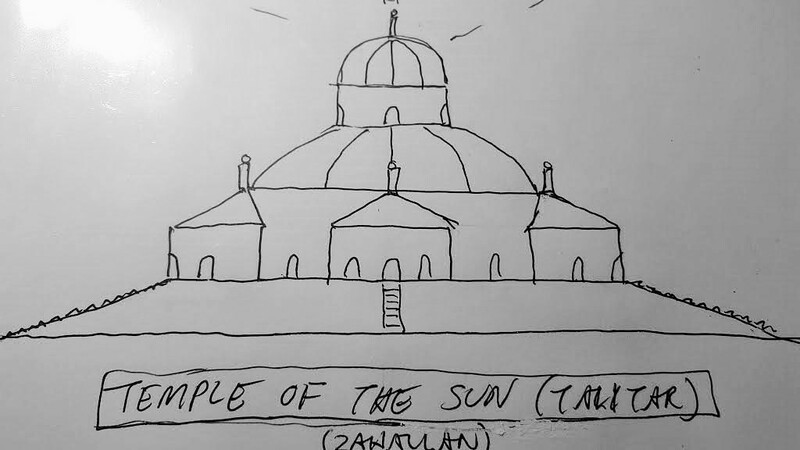 The priest explained that when Zahallan was first settled, this temple had been founded by a group of clerics specifically dedicated to the sun god Talitar. Some generations later, a pair of powerful wizards took up residence here, and endowed a temple to Yaziel, goddess of magic and the moon. As Kasim questioned them further, he located the report on the thief, and pried Jumari's name from them. He insisted on hearing the half-orc's testimony before taking further action. Fatou realized that the castellan had used detect evil on her and Lucretia during this discussion, and excused herself. She promised to bring Jumari, or to send a message with her information, and also promised to stay off the grounds at night without the castellan's permission, as she did not want to stir up bad blood between her temple and his. Meanwhile, the others went to take a closer look at the northernmost mausoleum in the Garden, which was labelled "Taroon" in both Common and Halfling, Edel recognized this as the surname of the current Constable of Zahallan, Sheik Nerida Taroon (a human woman). While ZhaZha stood lookout, Jubair approached the door and found it locked. He attempted to pick the lock, but failed, so moved away from the building to avoid being seen working at it. This turned out to be wise, as a pair of temple guards passed by moments later. They eyed the PCs warily--particularly Jubair, whose cheerful wave seemed suspicious. But seeing the PCs moving along, they resumed their patrol. Fatou and Lucretia found their friends, and relayed the result of their talk with Kasim. After some discussion, Jumari agreed to speak with him, and Edel accompanied them in case a more diplomatic voice was needed. Kasim questioned the half-orc at length, until she gave complete enough answers to satisfy him. When Jumari stated that she planned to kill any death cultists she found, Kasim pointed out that there were ways to take them alive, as prisoners for further questioning. Jumari acknowledged the sense in that, and admitted that she should have brought the halfling graverobber to him instead. Kasim asked the others what they proposed to do about the graverobbers. The PCs wished to stand guard in the cemetery, without the temple guards interfering, so that they could try to catch these criminals. Kasim asked if they knew how the robbers got into the grounds. Jumari explained about the wall, and at the castellan's request, led him to the spot. Once there, Kasim concurred with the half-orc's findings, and asked further questions about what she had seen of the intruders' locations and movements. While they waited for the others to return, Jubair and ZhaZha checked out the other large mausoleums in the Garden. Jubair was able to read the name "Jurjani" on the southern crypt, and recognized this as the name of a prominent family of halfling merchants in town. A third large mausoleum stood atop a large hill at the garden's center. The religious iconography here was elaborate, even by this cemetery's standards, and its exposed position made the rogue give it a wide berth. The rest of the group located their two missing members and introduced them to Kasim. 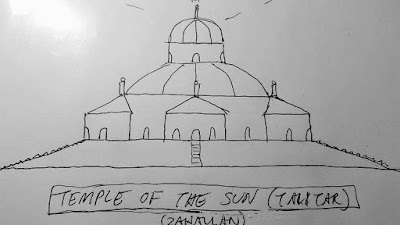 When Jubair asked if he could use the central mausoleum to stake out the cemetery, the castellan sighed, and very politely asked him not to--the temple's departed priests were interred there. Edel persuaded Kasim to agree to let the party keep watch in the cemetery--at least for a few nights. The castellan introduced them to the guards who were on the roster for patrol duty that night, so that those minions would be aware of the plan as well. That night, the party chose their positions for staking out the north side of the cemetery. Jumari would hide near the grave that was disturbed the previous night, and make use of her detect evil ability as she kept watch. Jubair would hide near the north wall, while ZhaZha patrolled part of it. Lucretia and Fatou would wait near the Taroon mausoleum. Edel would wait outside the wall, using detect magic, to watch for the cultists' approach.